Viners were rolling back the years at the latest Netball in the Community festival, taking the winners’ medals in the walking netball section thanks to some great court play, team spirit and shooting from Tracy Irvine. 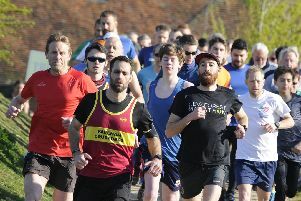 The former Gosport & Fareham League team, now playing the walking version of the game weekly at Gosport Leisure Centre, only lost the one game throughout the event, writes Helen Dunning. They played with great support and sportsmanship for their fellow opponents. It is a key element of any Netball in the Community festival. Netbelles, from Surrey, finished second but it was very close with the medals decided on goal difference, just five goals between the top two. 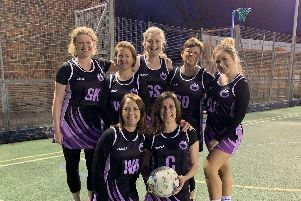 In the Social Netball section of the event Hayling Island ended the day as champions from a spirited Knowle Hotshots team. Both teams are regulars at Netball in the Community events and host Debbie Laycock was delighted with the spirit and sportsmanship shown. She said: ‘Our festivals are fun and friendly and those teams who take their netball seriously are asked not to attend. ‘We had 13 teams at our recent event and credit to all the players for making it extra special. Rebecca Cave, from the Red Box Project Portsmouth North, said: ‘Thank you for the truly incredible kindness from you and your teams of netballers. ‘When you announced how much money had been raised I was really blown away. Supporting young people in education is key to not only their future but their well-being, confidence and positive mental health. In the spirit of the festival awards were given for sportsmanship. Sarisbury Sparks Allstars were awarded the Team Sportsmanship gong, while Maddie Roberts from Portsmouth Pivotals and Bridget Hargreaves from Walkie Talkies took home the player-of-the-day awards.